GoodReads Summary: Sometimes, the greatest comebacks take place far away from the ball field.Meet Peter Friedman, high school freshman. Talented photographer. Former baseball star. When a freakish injury ends his pitching career, Peter has some major things to figure out. Is there life after sports? Why has his grandfather suddenly given him thousands of dollars worth of camera equipment? And is it his imagination, or is the super-hot star of the girls' swim team flirting with him, right in front of the amazing new girl in his photography class? In his new novel, teen author Jordan Sonnenblick performs his usual miraculous feat: exploring deep themes of friendship, romance, family, and tragedy, while still managing to be hilariously funny. What I Think: Jordan Sonnenblick is awesome. He might very well be the king of YA realistic fiction male protagonists. Every time I talked to someone about this book and tried to explain it, I realized there were so many layers to this book. I started of saying it's about a boy who loves baseball but gets hurt and now can't play...but then there is so much more to this story. Sonnenblick is able to write characters that we love, characters that have to deal with hard situations, and still characters who make the most of what they are going through. He is able to capture the trickiness of a boy liking a girl and going from friends to more than friends. It is so much fun to read but at the same time serious. I recommend every book that he has written. 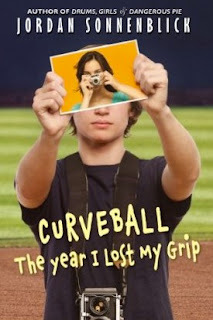 Curveball is another great addition to the books Sonnenblick has written and is worth adding to any middle school or high school library. I have been talking with students recently about taking a moment and exploding it. Like stopping time in writing and describing every little aspect of a moment. Sonnenblick does an amazing job of this at different times in Curveball. It is a great mentor text for talking about how doing this can help the reader really get in touch with the character and what is happening at that moment. Writing Prompts: Write about a time in your life when circumstances that you couldn't control meant that you couldn't do something that you really wanted to do. Write about a time in your life when you had to do something hard that you felt was too hard for you to handle.